After an astonishing tour featuring Chicago Blues Legend Eddie C. Campbell, Los Gatos Bizcos (The cross-Eyed cats) are proud to present to the public their new album “I can't believe my eyes”. Los Gatos Bizcos just play music the way music is supposed to be played, capturing and combining the essence of Blues, Rock, Swing and Soul. Music and Mr. Eddie C. Campbell made all this possible. Quique Gomez, lead singer and Harmonica player of Los Gatos Bizcos, met Eddie C. in Chicago. Few months later the band was backing the Chicago Master up on his European Tour. The tour and the opportunity of learning and experiencing the knowledge of one of the greatest Chicago Blues artist, was just the beginning of what now has become a solid and well know band throughout the whole country. 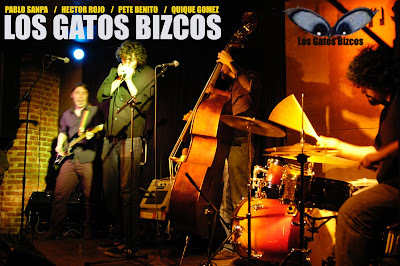 Starting from March 2012, Los Gatos Bizcos will be performing in almost every major city in Spain. After summer they will release the CD in Europe. Therefore, do yourself a favor; don’t miss out what could be one of the best musical experiences ever! “I can’t believe my eyes” has been recorded like one of those “old school” records by Santi Martin at Funkameba Studios in Madrid, Spain. Eleven tracks, most of them originals and some covers, featuring of course Eddie C. Campbell on “That’s when I know”. He has played with leading figures in the African-American black music as Bob Stroger, Jimmy Burns, Rockin Johnny, Katherine Davis, Tail Dragger. He is also vocalist with the Bob Sands Big Band. This fine young guitarist is the regular collaborator of Red House. He has played with heavyweights such as Gene Taylor, Lou Marini, etc. .. Participated in the Spanish tour of Buddy Miles. Today he is a member of the band De Pedro, Josele Santiago. Stylish drum work from this great musician. Member of the Bob Sands Big band and collaborator in enumerable side-projects.